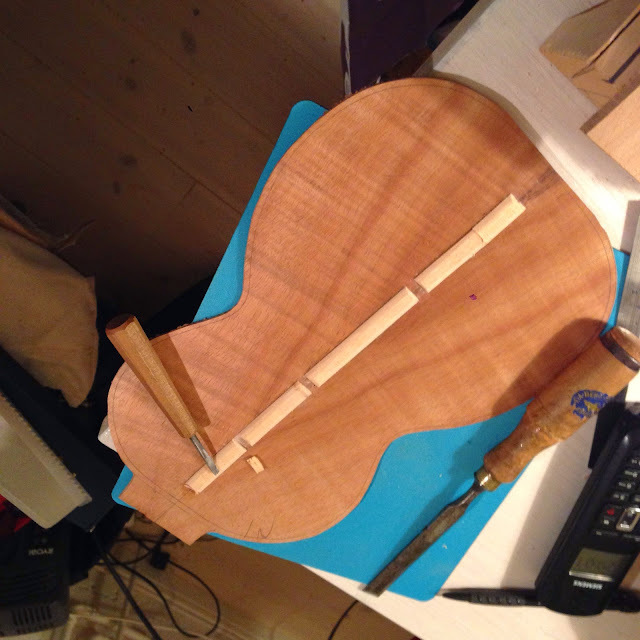 Tonight I did some work on the tenor which is in progress. 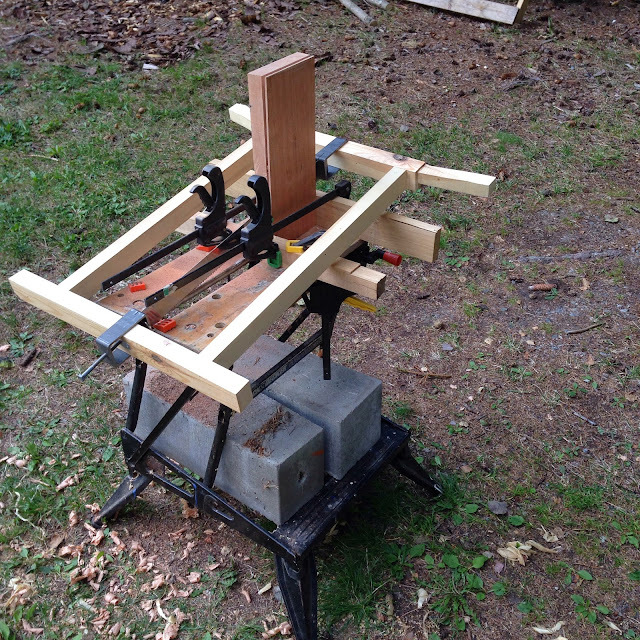 The first pic shows it clamped on the workboard. You can see the pickup I installed, a K&K twin spot. It's very neat and the cable won't rattle against anything. 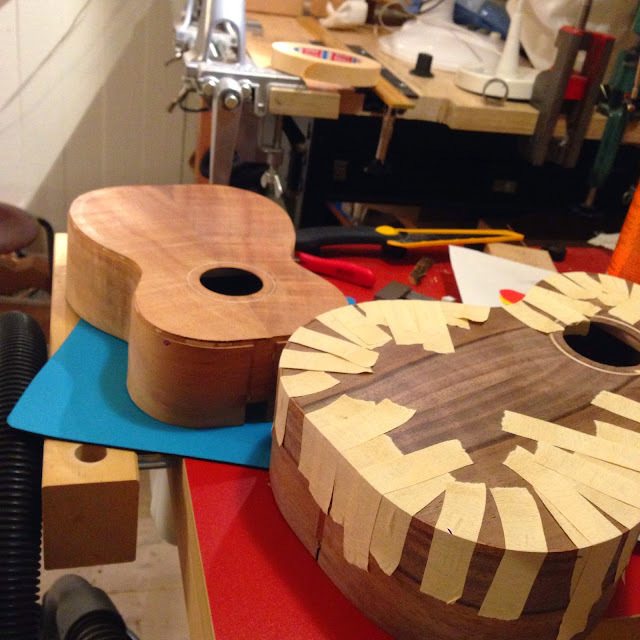 But I found it irksome to get the nuts tight enough and would not attempt to mount one of these on a completed uke, the back being off was crucial for me. I build backwards, putting the braces in the body and not on the back. 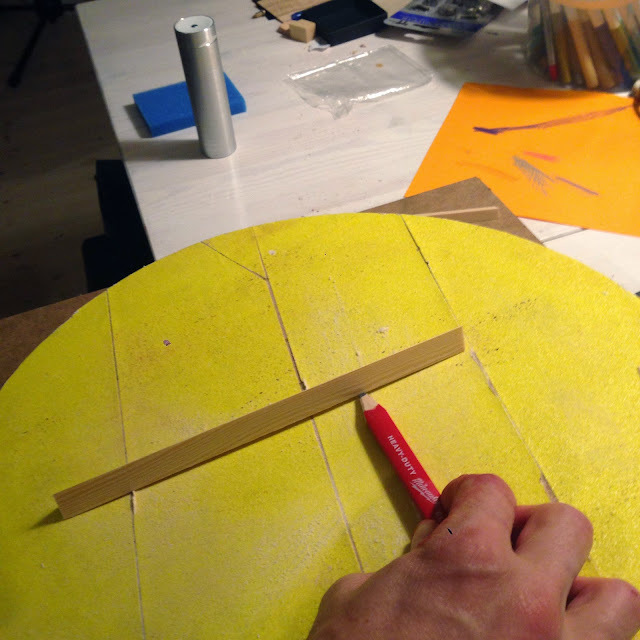 Here you can see me tracing the curvature on the radius dish. 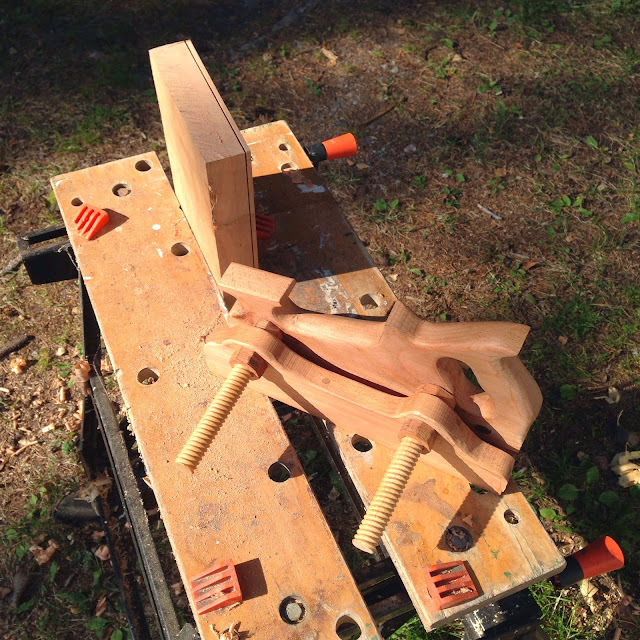 With the Veritas apron plane clamped in the Zyliss vise I take the braces close to final shape. 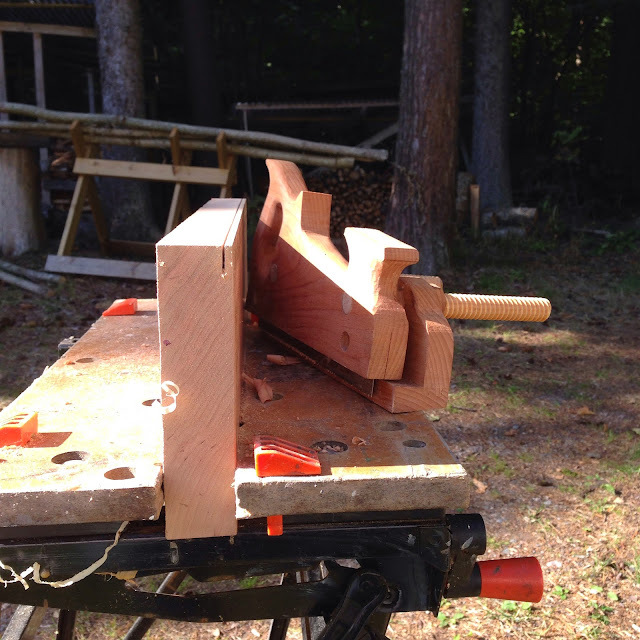 The braces are triangular in section, I sliced a longer rectangular profile into three pieces on the mini table saw. Grain direction is vertical. Then some super fast sanding in the dish. The braces are shaped with a carving knife and the miniature block plane (which is a lovely tool). The notches in the linings are cut with a model maker's saw, I think it's an Exacto. I used one of these in England this summer and bought one when I got home. I've used a Japanese saw for this earlier but it's too aggressive. The notches are triangular to suit the braces. Done. Would you look at those brass clamps? They're available online, I think I got mine from a webshop in New Jersey. Also, in the foreground is my friend Tiny Plane, and its friend Wee Shavings. Humidity is down and once again it's safe to glue larger pieces. Tonight I'm working on the koa concert I have in progress. 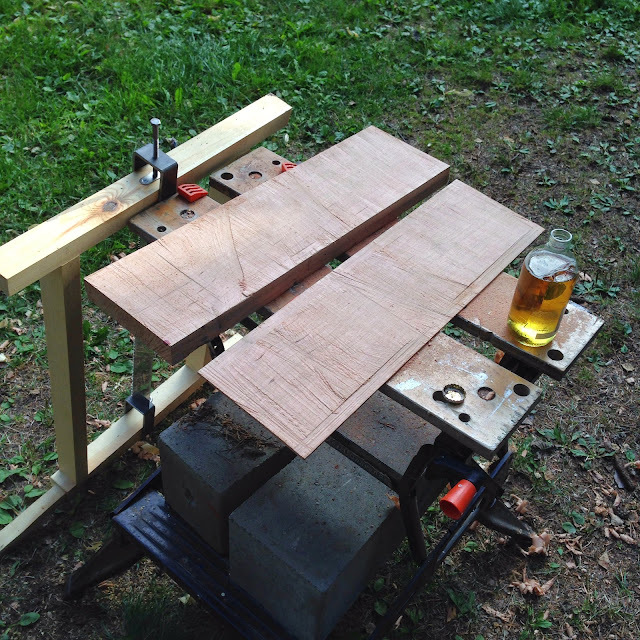 This particular koa wood has been a bit of a challenge but I think it'll all be fine when I'm done. First I chop out gaps in the cross banding strip. 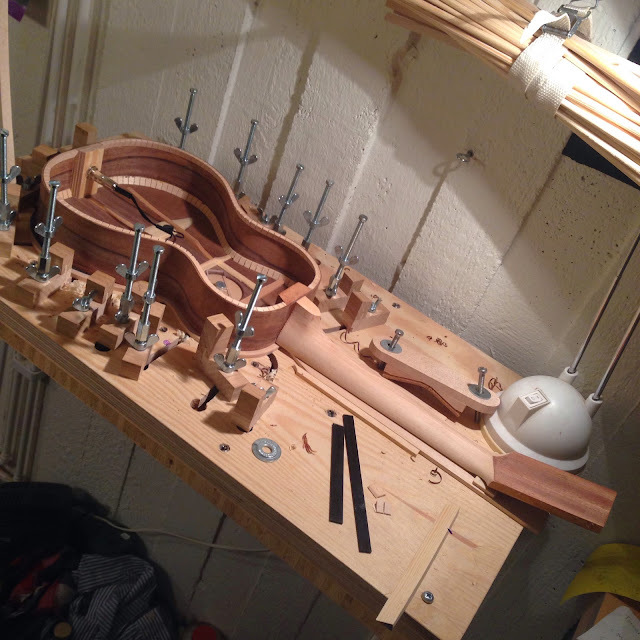 Remember, I build the bodies with the back braces in place before I fit the back. How stupid. The picture is upside down. But no matter. 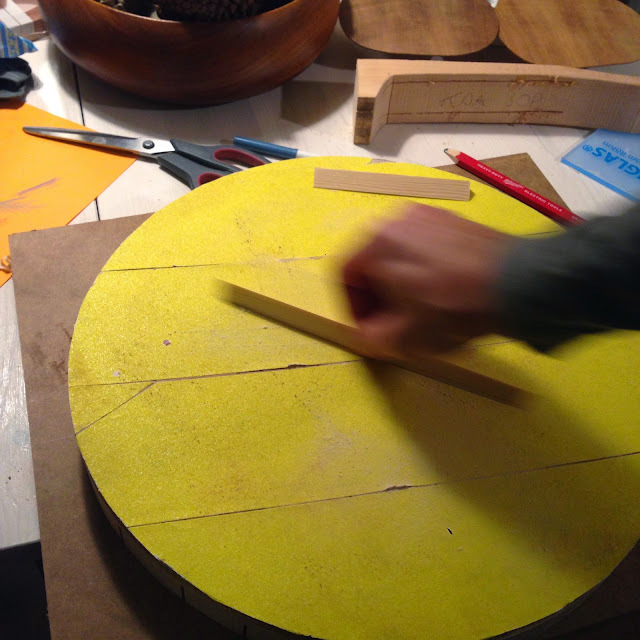 After the notches are cut I test it in place. And then I spread glue and clamp it all down. A couple of go bars complete the setup but the screw/slat arrangement is really good. 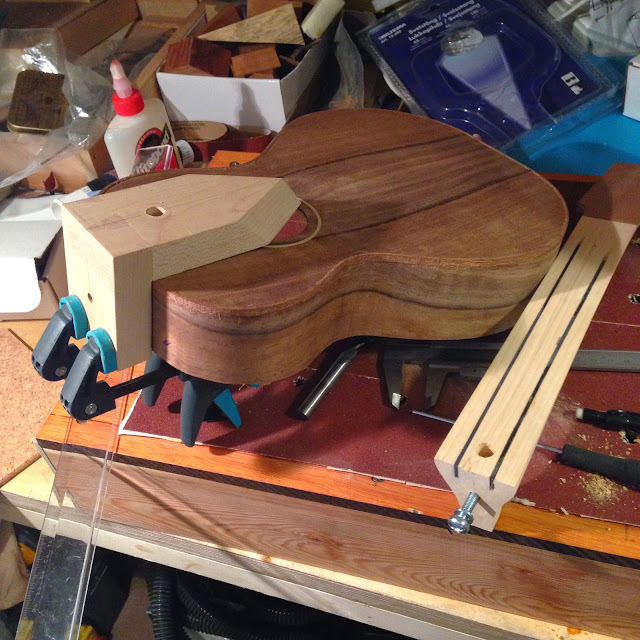 I should also mention that I set the final neck angle by placing a shim under the nut end of the neck before I clamp the uke to the workboard. 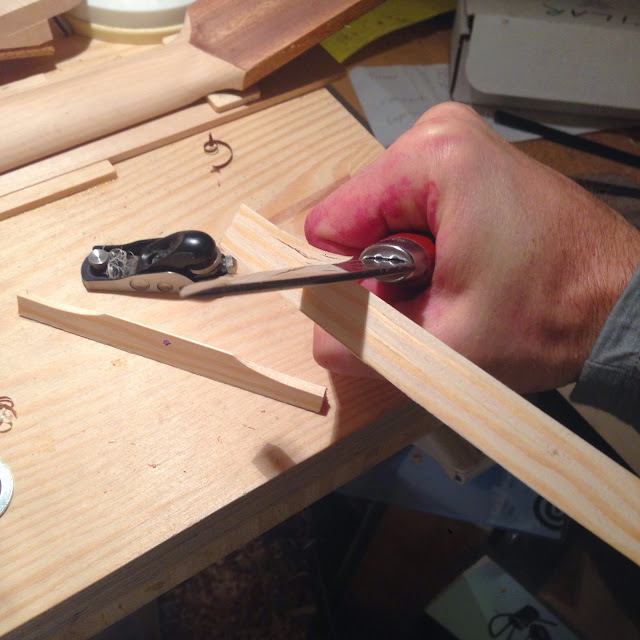 After tightening the wing nuts I check for squeeze out with a small mirror. Had my workshop been of proper scale I would have wandered round my big ruobo bench and looked from all sides but as it is I use a small mirror. Something's up with autumn here in the far North - weather's better than it is most summers. 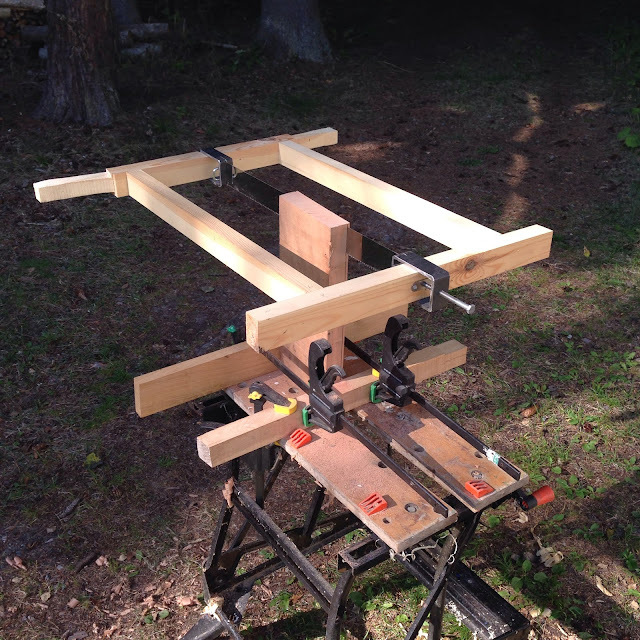 We're at the summerhouse and I already mowed the lawn so it was time for some resawing with the kerfing plane and the frame saw. This is what we'll use, more or less. 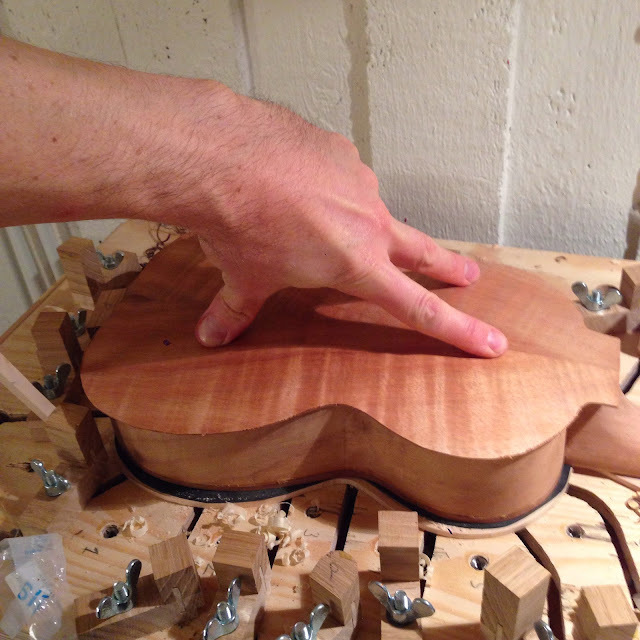 The chunk of wood is cherry destined for some piccolo ukes. First I needed to true the face of the board, I used a no. 4 and a no. 7 plane. I actually quite like the Black & Decker Workmate bench (not that I'd ever admit it in public). Especially on sunny days. 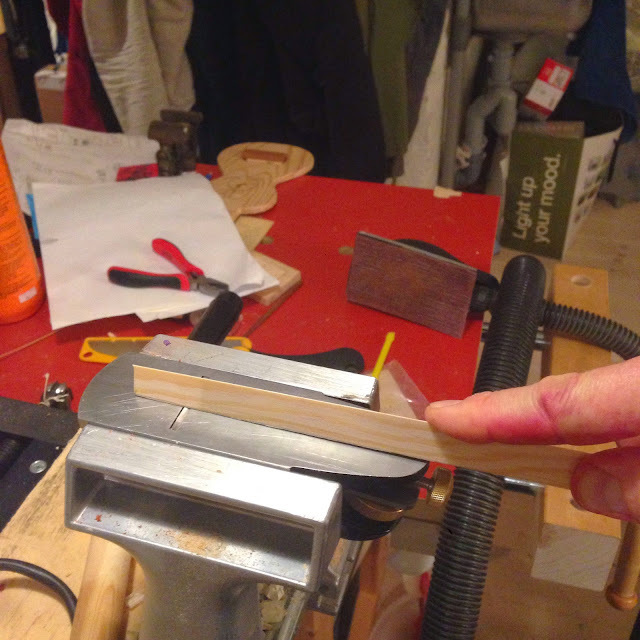 After that I started making the kerf along the planed face using the kerfing plane. I set the fence to roughly 5 mm. All four edges are scored. I noticed that the Workmate started to rock a bit when I did the ends. Out came the frame saw, and away I went. The bench almost jumped. 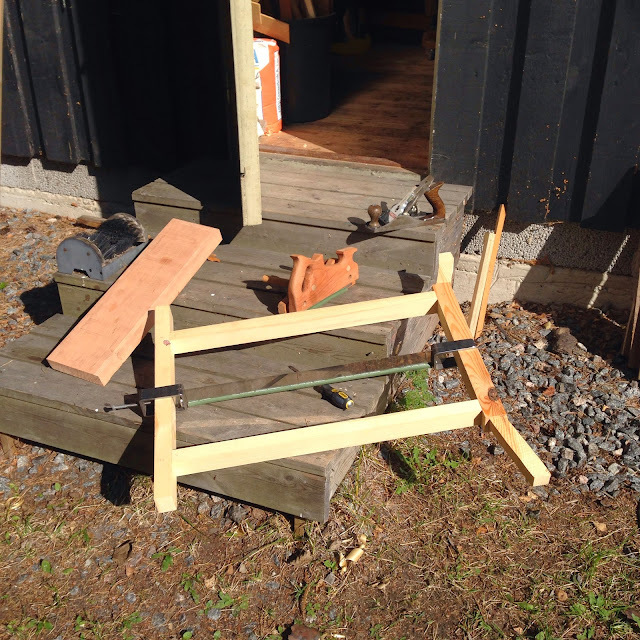 The clamps and slats helped steadying the plank and keep it from rocking loose. So I put a couple of concrete plinths across the base, and then my dad came by and gave me a hand by holding the top of the plank while I struggled with the frame saw. After around twenty minutes I was through. And these are the surfaces, in need of some planing. And indeed a beer in need of some drinking. 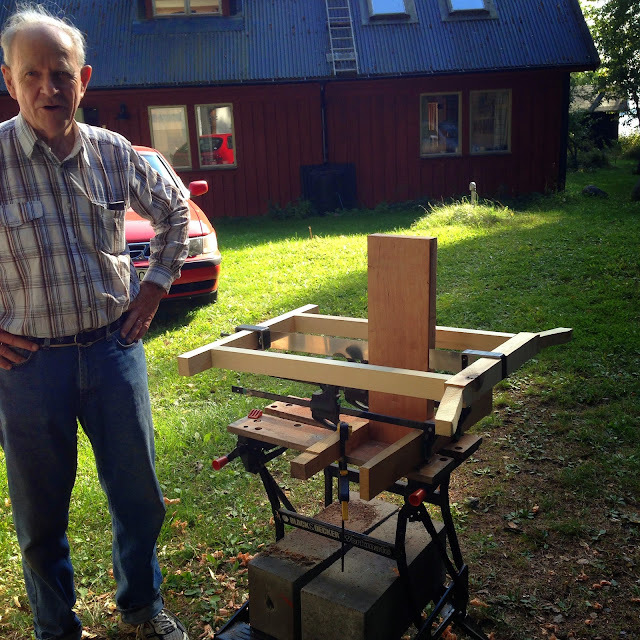 Both the kerfing plane and this frame saw are the designs of Tom Fidgen. Check him out on Youtube for some high grade inspiration. 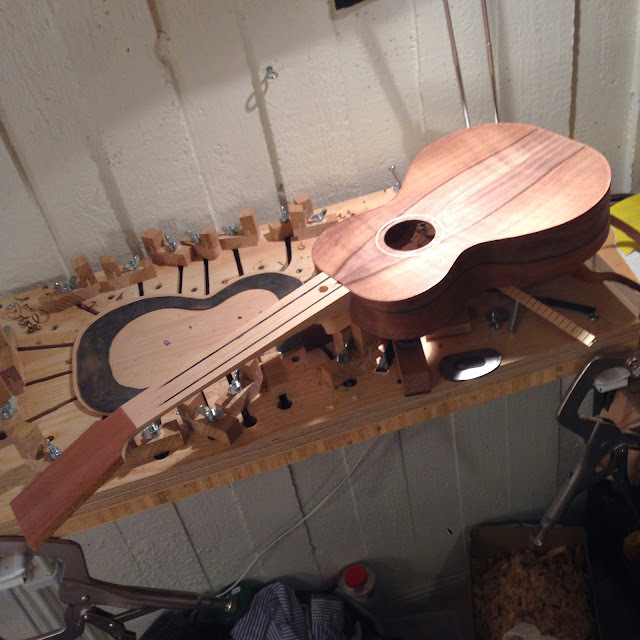 The walnut tenor turned out to be flat and square where it needed to be flat and square, and its alder neck was also dead easy to align. 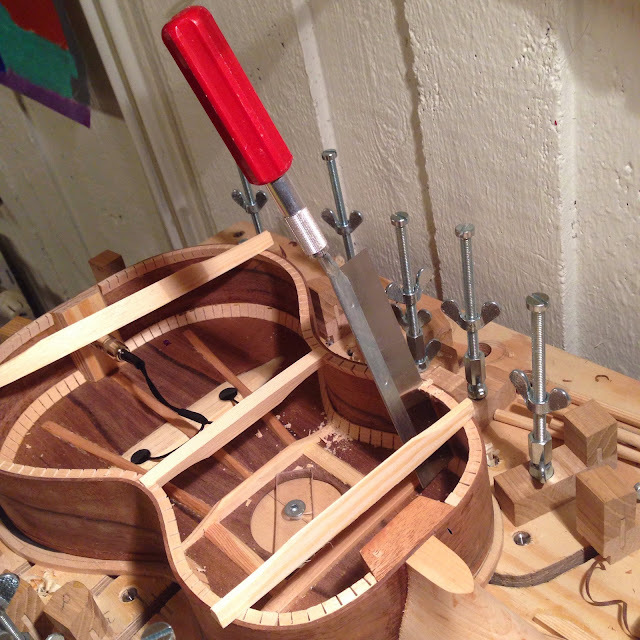 Usually I do quite a lot of sanding on the mating surfaces to get the centerlines perfectly straight and I also shoot for either a slight neck angle or a flush surface from neck to soundboard. The final neck angle I set when I glue the back so as long as I don't have a negative neck angle at this stage I'm content. Pointy end at centerline and away we go! 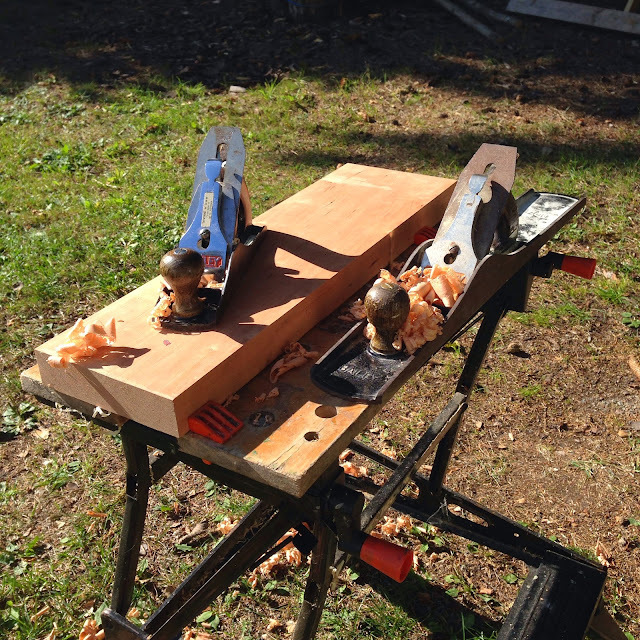 The jig fits the Zyliss vise beautifully. 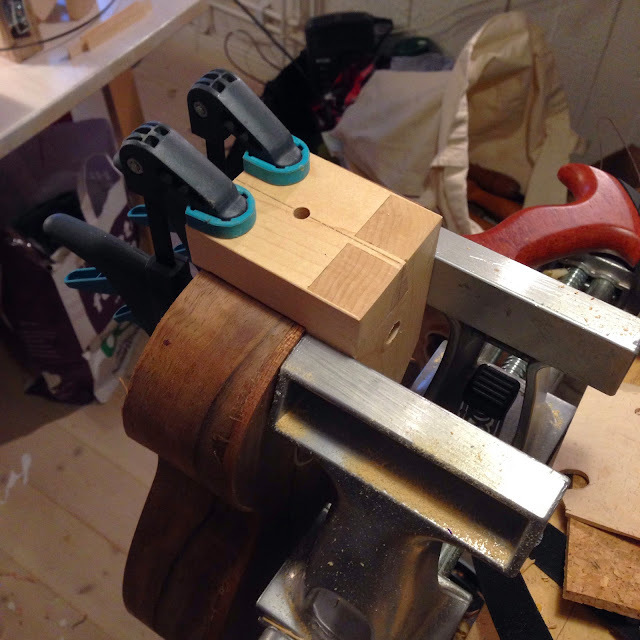 The neck gets two holes since the barrel bolt is there, 10 mm for the bolt and 6 for the screw. I used to make my own barrel bolts to get down to 8 mm, but that was hard work so now I just buy the standard ones. This last pic is from the dry fit. I often make the hole in the neck block 6.5 or 7 mm to get wiggle room but that wasn't necessary today. Now off to the office. 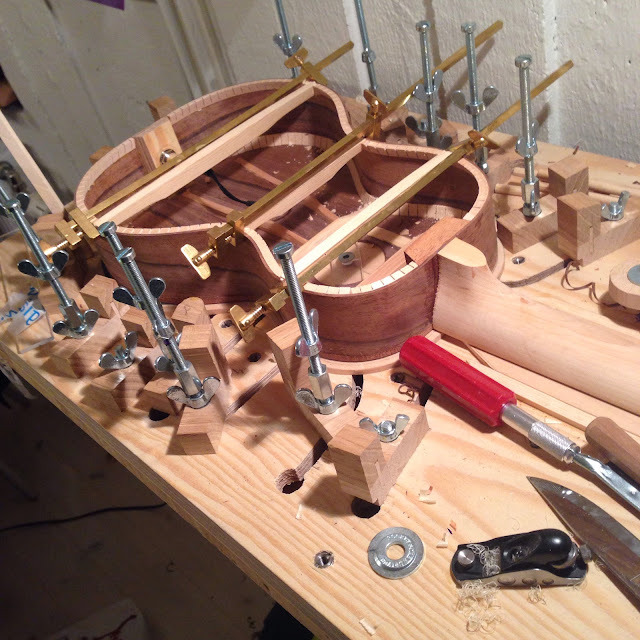 Since I got back from the Middle East I've braced the concert soundboard, glued it to the sides and worked on binding both the concert and the tenor. 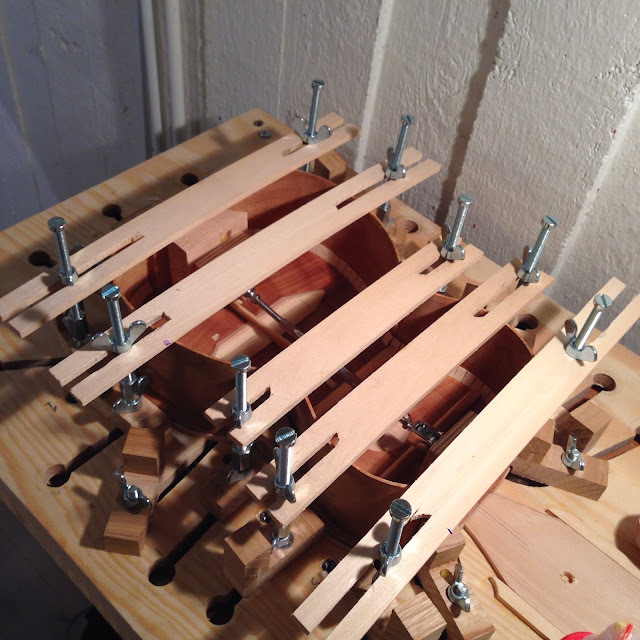 I shape the braces with a large array of tiny planes. It's resting on a mouse mat that I bought on sale, and you might remember the Dust-E-Whacker. This concert will be slightly narrower than my other ones, the sides were a little shorter than I had wished. 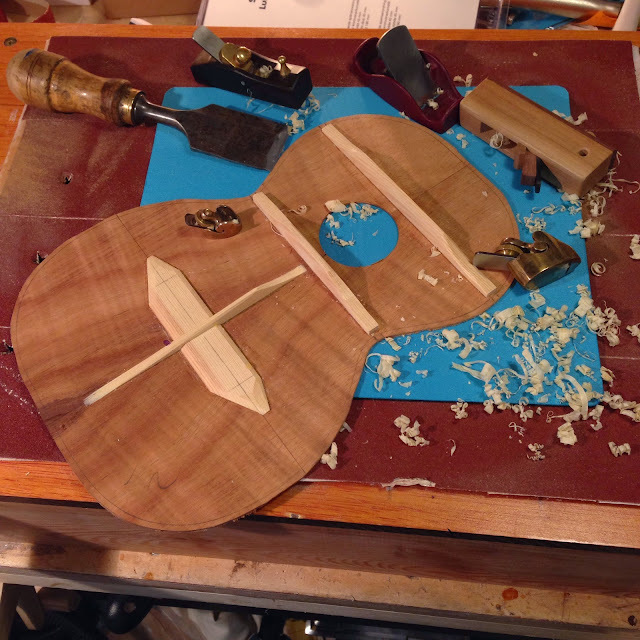 I routed the binding channel on the walut tenor. And it's an easy wood to work with, no surprises and no splinters or tear-outs. But I have to wear a dust mask. 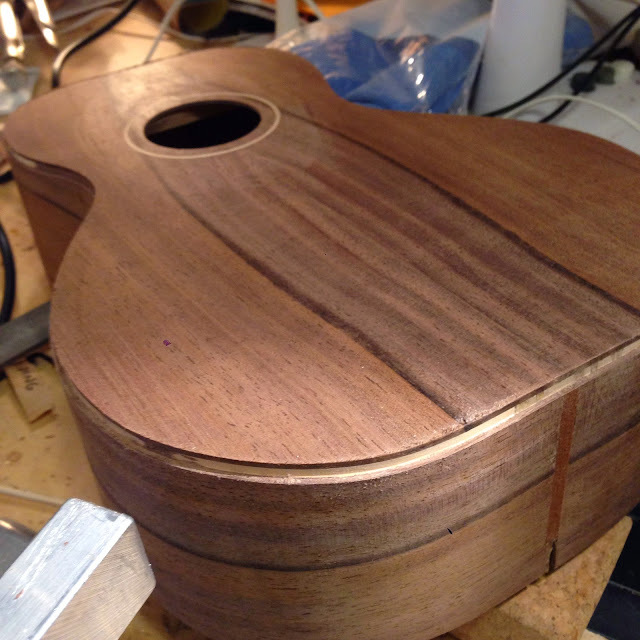 The last pic shows the binding installed and taped, and the concert has been routed as well. 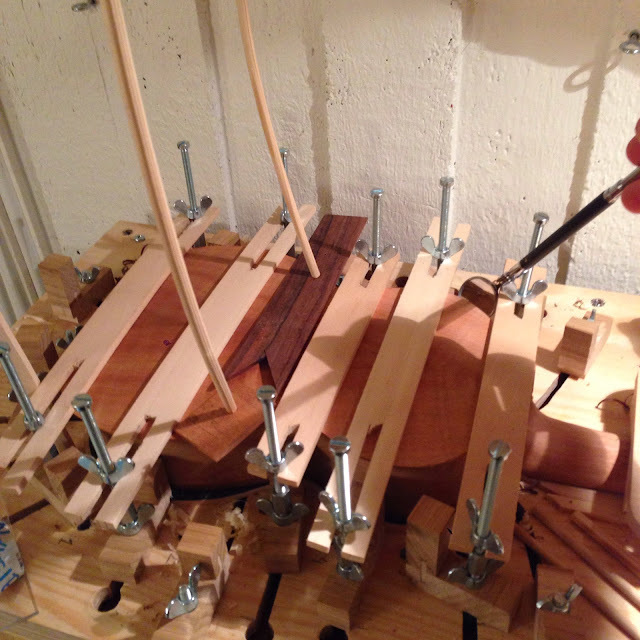 On both I bent a single piece of mahogany binding, but that is unnecessarily difficult really. You have to be really careful to avoid gaps which will appear if the distance between the two waist bends isn't exactly right.